In the season of harvest, Jackie Macadam discovers a number of churches making creative use of property. 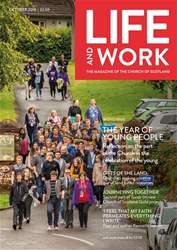 YOUTH Cafés and clubs; lunch groups for the elderly; groups designed to help people with dementia and their carers; children’s playgroups and crèches for immigrants or refugees and their children; summer holiday clubs – they’re all taking place in church halls and rooms the length and breadth of Scotland. Sometimes though, something special is created, using imagination, willpower and determination that draws its strength from the land. ‘Blackhill’s Growing’ is based at St Paul’s Church in Provanmill, Glasgow.